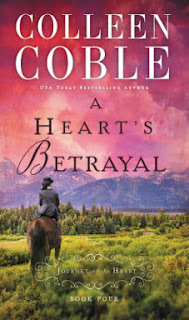 Every month, I've been posting about Colleen Coble's A Journey of the Heart series. This month, we're up to book four, A Heart's Betrayal. I have liked this series so far, but haven't been wildly enthusiastic. This book started off introducing a brand new character, Emmie. Emmie is the sister of the bad guy from the first half of the series, and I like her. Emmie has just lost her husband, after only a couple months of marriage. She's distraught, but things are about to get worse as she finds out that she wasn't really married. He already had a wife and child. Emmie really has nowhere to turn, at least nowhere respectable. So she ends up heading out to Fort Laramie, to help Sarah Montgomery. A fresh start, somewhere new, where her non-marriage isn't known. Only nothing can ever be that simple. I really enjoyed this story, including the characters from the first three books. Now that everyone is happily married, they are far more likable! Emmie just tugs at me. She has a no-good scoundrel of a brother, a bigamist for a husband, and now the system leaves her with few choices. No wonder she is bitter and untrusting when it comes to men. For the first time in this series, I am eagerly looking forward to the next book, and I'm guessing it will be waiting for me when I get home.